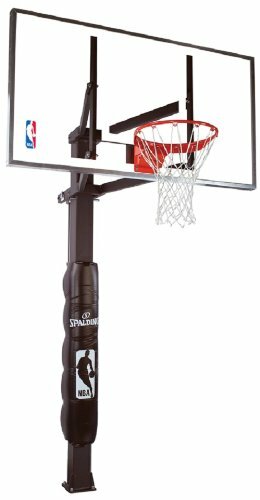 The Spalding 888 is a mid-high end in ground basketball hoop system which features a tempered glass backboard, U-turn Pro Lift system for height adjustment, J-bolt anchoring system, and a Spalding branded pole pad. You also have the option of choosing between 54″, 60″, or 72″ backboards. Installation of this in ground hoop is pretty straight forward with a few steps requiring at least 3 adults. Pouring the concrete and assembly of the pole should take around a few hours, not counting the curing time of the concrete, as this is just a one piece pole. The backboard installation is where there will be a bit of work. If you have a pickup bed, everything will be so much easier. If you don’t you can use ladders but would still be somewhat difficult. It is heavy so 3 adults is recommended for easy installation as well as safety. The U-Turn Pro Lift system makes it easy to adjust the height of this hoop. Despite the weight of the backboard, using the jack is surprisingly easy. The height can be adjusted from 7 feet to 10 feet with infinite increments, making it attractive for those who want a fully customizable height for their basketball goals. As expected from Spalding, especially in this price range, the sturdiness of this hoop system is top notch. From the tempered glass backboard all the way to the 11 gauge steel, it would be very difficult to put a dent in this. The one piece pole also adds to the solidness of this hoop. The pro-Image breakaway rim can take rim rattling slams too. We put the price as a con in the list above but to be perfectly honest, you get what you pay for with this hoop, we just wanted to put a con in the list :). This in ground hoop from Spalding screams perfectness. You get a top notch hoop system that would probably last a lifetime as Spalding really went all out in ensuring the quality of this product is second to none. The Spalding 888 is definitely recommended.